What can it do? That’s not really the question - the question is, can you master it all? Futuro Cube is loaded with sensors monitoring movement, gravity, touch, gestures and more. It processes all the data in milliseconds and communicates with you through light, music and sound. Futuro Cube is a game console packed with action games and brain-teasers. Its users are from a broad cross-section of society, from youth to seniors, from IT specialists to nurses, economists, actors and mangers. From our wide variety of games, everyone can find their favorite. A full list of games can be found on our games link. Our collection of games and brain-teasers is constantly growing thanks to our firmware updates. When your current games no longer interest you, it’s simple to download new ones. Information about new applications can be found on our updates link. Forget about keyboards and touch displays, Futuro Cube comes with something completely new. The basis is on turning and tapping, and full control is comprised of sophisticated gestures. 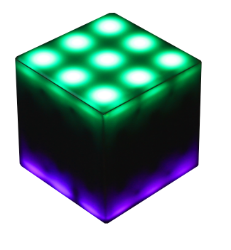 Futuro Cube is a black cube with light diodes, audio cues and vibrations. Each side can display color points with the effect of light diffusion of various intensities. 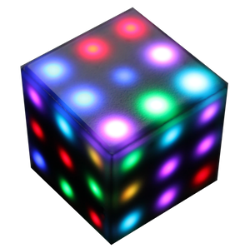 Play is accented by sound effects and the Cube’s speaking voice. Wireless connection allows for two Cubes to communicate at distances of up to 5 meters. Your opponent, therefore, doesn’t always have to be the Cube, itself; you can play against your friends. Multiplayer mode can be activated with games such as Gomoku, Tetris and Multiconnect. Can you imagine more fun under the Christmas tree? The Futuro Cube runs on a rechargeable battery that provides a number of hours of play. To recharge, simply connect to your computer via the standard micro USB cable or a web adapter. Some of the games are quite difficult logical challenges that require you to study the problem and figure out algorithms to solve it. Puzzle games are a timeless entertainment that continue to develop—those who loved Rubik’s Cube will love Futuro Cube. Many game enthusiasts love Five-in-a-Row (Gomoku). Playing it on a cube, however, proves to be several orders more difficult because your spatial imagination is not used to similar tasks. In fact, many Futuro Cube games are based on familiar games; however, when adapted to a cube, they force the player to stretch his spatial memory and imagination.